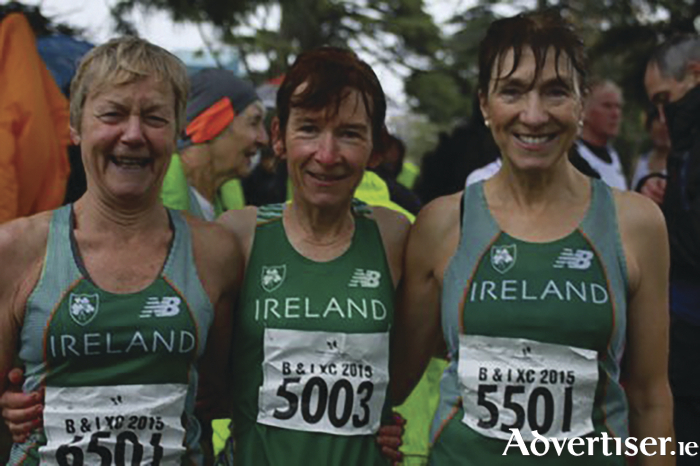 Mayo AC trio Mags Glavey, Angela O'Connor, Pauline Moran in their Irish vests at the Britain and Ireland Masters Cross Country Competition. Last Saturday the British and Irish International Masters Cross Country took place at the sylvan setting of Santry Demesne, where it was Ireland's turn to host the annual event. Mayo AC continued their remarkable record of representation in recent years. The club had three members in the Irish women's team this year - all have had previous experience in this competition. All age category teams competed against their peers from England, Wales, Northern Ireland and Scotland. From Mayo AC Angela O'Connor was in W50 category, Pauline Moran led the W55s, and Mags Glavey captained the W65s. They were in the first of three races - 6k over three laps - which included all women, and men over 65, 70, 75. They had two other Connacht masters for company -Martin McEvilly (GCH ) M65 and Roger Rushe (Tuam AC ) M75 making his debut in an Irish vest - and an inspiration to all. The course was flat but conditions were cold, wet, breezy, and soggy after a lot of recent rain which persisted during the event. However,we were treated to three races embodying the true spirit of the sport, with endeavour, endurance, and enjoyment displayed by more than 300 participants. They enjoyed the camaraderie in groups circling in the shelter of pine trees which formed team base-camps. The W50 team won bronze, with Angela O'Connor their third finisher in strong support, Pauline Moran was in fine form again as she showed in the trials, and led the W55 team home but they were out of the medals. Glavey had a great race and led W65 team to gold and finished with a fantastic bronze individual in her category. Not surprisingly she was over the moon. Mayo AC are proud of the performances of three wonderful women representing the club at International level.